Generation One: The Search For Black Wealth | New Growth Hair Magazine | We capture the culture of urban barbershops and beauty salons. 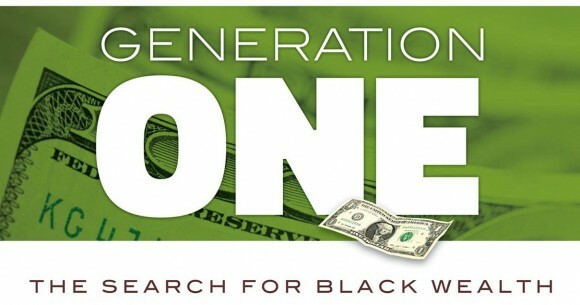 Generation One: The Search For Black Wealth, a documentary that tackles the lack of generational wealth in the African American community, is a must see film. In 1867, at the end of slavery, African Americans held 1% of the total wealth of the United States. In 2015, African American hold roughly 1% of the nation’s total wealth. Based on reports from Pew Research Center, the 2008 financial crisis hit African Americans harder than other Americans. Lamar and Ronnie Tyler, the husband and wife power pair behind documentary films entitled Happily Ever After: A Positive Image of Black Marriage, You Saved Me, Men Ain’t Boys, and Still Standing are the executive producers of Generation One. The Tylers also are the creators of Black and Married with Kids, the largest independent African American marriage and parenting website. Below is my in-depth interview with Lamar Tyler about their latest film. The lack of generational wealth is the biggest issue facing the African American community. Phillips: What inspired you to create Generation One? Tyler: We’ve created four documentaries focused around family and marriage. Generation One was the next step because the lack of generational wealth is the biggest issue facing the African American community. Without wealth in the African American community, we have no economic power or political power. If we don’t make a concentrated effort to gain generational wealth, then we will still be marching 40 or 50 years from now, trying to wrap our heads around why people are killed in our community with no repercussions. The fight for economic empowerment is extremely important right now. I appreciate the opportunity to share Generation One with your readers. I encourage everyone in the community to check out the film. I’ve received feedback from African Americans who are doctors, lawyers, dentists, and attorneys who felt like they were making good financial decisions until they saw Generation One. The professionals that I just mentioned have an above-average income, but many of those professionals also have above average spending habits. So, they make a lot of money, but their money isn’t being used to create generational wealth. The goal of the film is to get viewers to rethink or review their thoughts on wealth. The goal of creating generational wealth isn’t just to make sure that you are straight. Our community needs people who are focused on making sure that their children, grandchildren, great-grandchildren, and great-great-grandchildren are straight. When I say straight, I’m not just referring to money. I’m also referring to a wealthy mindset. Phillips: Some people believe that wealth creation is reserved for business people, entertainers, and professional athletes. How can you get people who think that they aren’t able to become wealth creators interested in watching your film? Tyler: In Generation One, Deborah Owens discusses an interview in her book about a man who was a Baltimore, MD parking lot attendant who amassed over one million dollars. Over the course of his career as a parking lot attendant, he made and grew investments until he became a millionaire. As his resources grew, so did his financial education. The wealth issue in the African American community is a symptom of the lack of financial education. Even if some of your readers don’t think that they are wealth creators, I want them to watch Generation One. In the film, our experts break down wealth generation strategies that everyday people can use to create wealth. Also, we discuss the topic of small business as a wealth generation tool. The truth is that everyone isn’t going to be a business owner. In Generation One, Dr. Boyce Watkins said, “You don’t have to own your own business, but you can own a part of someone’s business by making an investment in their business.” An investment in a viable small business will probably provide a much larger return than saving money in a bank account. Phillips: What can African Americans do to develop a plan to start creating generational wealth during the holidays? The holidays are the perfect time to discuss building wealth with your family. Tyler: The holidays are the perfect time to begin planning for the new year. When your readers are with their family during the holiday season, it would be a great idea to have an in-home screening of Generation One, so that the entire family can discuss the importance of generational wealth. The holidays are a great time to eat, fellowship, and exchange gifts, but the holidays are an opportunity to discuss family business. After every screening, during the panel discussion, we ask the audience, “How many people have experienced the death of a family member who didn’t have money to cover their funeral expenses?” Ninety-five percent of the people in the audience raise their hands. If everybody isn’t on board with developing a plan to create generational wealth, let’s have the conversation about making sure that family members don’t leave this earth putting a financial burden on their surviving family members. During the holidays, family members used to buy toys that our children only played with for a few days. Instead of our family and friends wasting money on toys that our children didn’t use, we’d ask them to give our children money. Then, we invested our children’s money in companies that our children liked. Our daughters have shares of Krispy Kreme Doughnuts and Disney. Last year, when our family visited Disney Land, during lunch, my children were saying, “I own this chair.” My daughters knew that they didn’t own the entire park, but that they owned a piece of Disney Land. It was a feeling of accomplishment and empowerment that my children are learning the importance of building generational wealth. Phillips: Do you see a connection between the lack of generational wealth and the events that occurred in Ferguson, MO and Baltimore, MD? Tyler: Now is the perfect time for this Generation One because we need a movement. After Ferguson, similar events occurred in other parts of the country, and I heard people saying, “how could this happen again?” They were confused about how an unarmed black person could be killed and the person who killed them gets off without any consequences or repercussions. What all of this boils down to is us not having an economic voice. In communities with generational wealth, events that occurred in Ferguson and Baltimore will not happen without some type of serious consequences. Communities that have generational wealth get results from their politicians, because their politicians know that their campaigns won’t be funded unless they get something done. We need more political power but we won’t get political power until we develop economic power. Phillips: How can barbers, stylists, and hair professionals help to educate their clients about the importance of building generational wealth? Tyler: Barbershops and beauty salons are one of the greatest examples of entrepreneurship in the African American community and are excellent places to have discussions about building wealth. We have several barbershops and beauty salons that have purchased Generation One. They play the DVD in their salons and have conversations with their clients in the barbershop or salon. I know that people are discussing a variety of topics in the barbershop and beauty salon, but let’s give some more attention to personal finances, investment, and entrepreneurship. Barbers and stylists can be our first line of defense in the battle for building generational wealth. African Americans are spending billions of dollars on hair care products, but most of those dollars are going to people who aren’t African Americans. Phillips: What are the economic projections for African Americans if nothing is done about creating generational wealth in our community? Tyler: If nothing is done, then we are headed toward a very scary place. African Americans are spending one trillion dollars per year but very little of that money is remaining in our community. African Americans are spending billions of dollars on hair care products, but most of those dollars are going to people who aren’t African Americans. The companies who profit from us aren’t investing in our community. We are building generational wealth for other groups and not giving much thought to our next generation’s financial concerns. Now is the time for us to plan for the future. I encourage your readers to spread the word to their family, friends, and co-workers about Generation One.